Bryce Canyon National Park was one of many National Parks we were lucky enough to visit during our road trip around the USA in Elvis the Van. It was also one of my favourites. Each National Park turned out to be so different and special in their own right, but Bryce Canyon, Utah was like nothing that I’d ever seen before. It also helped that it wasn’t that busy when we visited either! 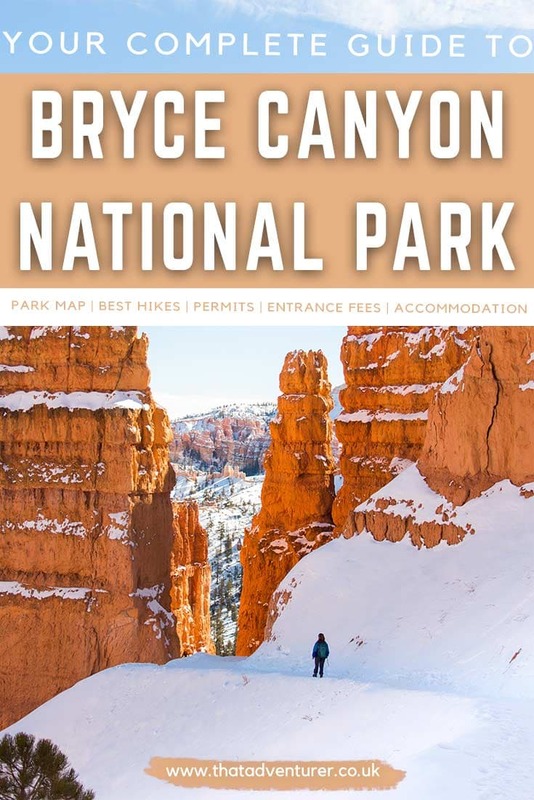 If you’re planning a trip to Utah and want to visit some Utah National Parks then make sure you check out this guide to Bryce Canyon and the top things to do in Bryce Canyon below. 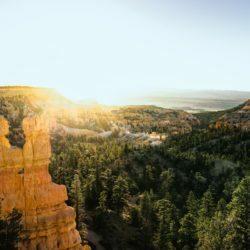 Where is Bryce Canyon National Park? 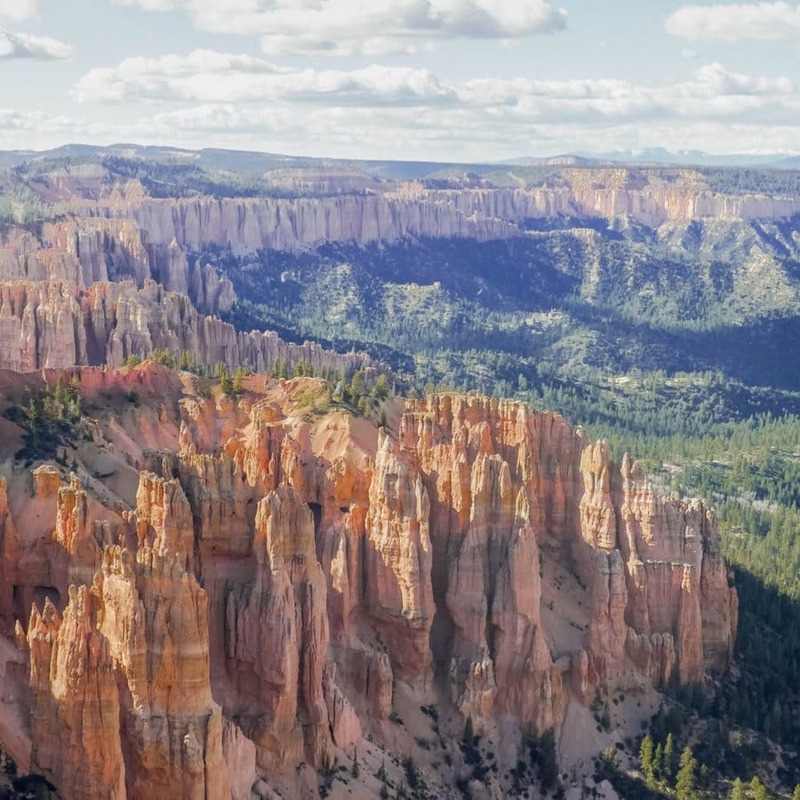 Want to know more about Bryce Canyon and things to do in Utah? Bryce Canyon National Park is located in south-west Utah and makes up part of Utah’s Mighty 5 Parks. The 5 National Parks in Utah are; Zion National Park, Canyonlands National Park, Arches National Park, Capitol Reef and Bryce Canyon. See this Utah map to the left to get your bearings. It’s mostly a map of southern Utah but you get the idea! 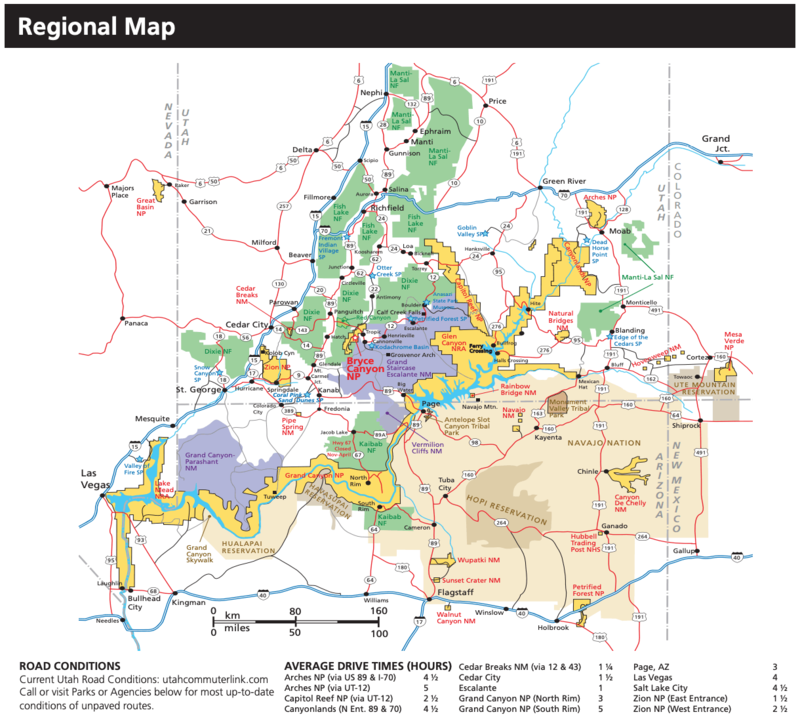 Take a look at the Bryce Canyon map below. The red road is serviced by a shuttle in busier months or you can drive it yourself. You can see the full Bryce Canyon National Park map here. If you’re planning to hike the Under-the-Rim trail at Bryce Canyon National Park, you’ll need a backcountry permit. This costs $5 and must be bought in person at the Bryce Canyon visitor centre. Any commercial activities will need a permit. Check this page for more details on Bryce permits. If you’re planning to go camping at Bryce Canyon you should reserve. There is a fee for camping and there’s a number of campsites that can be reserved from early May to late September up to 6 months in advance. Reservations fill up fast so get in there early. 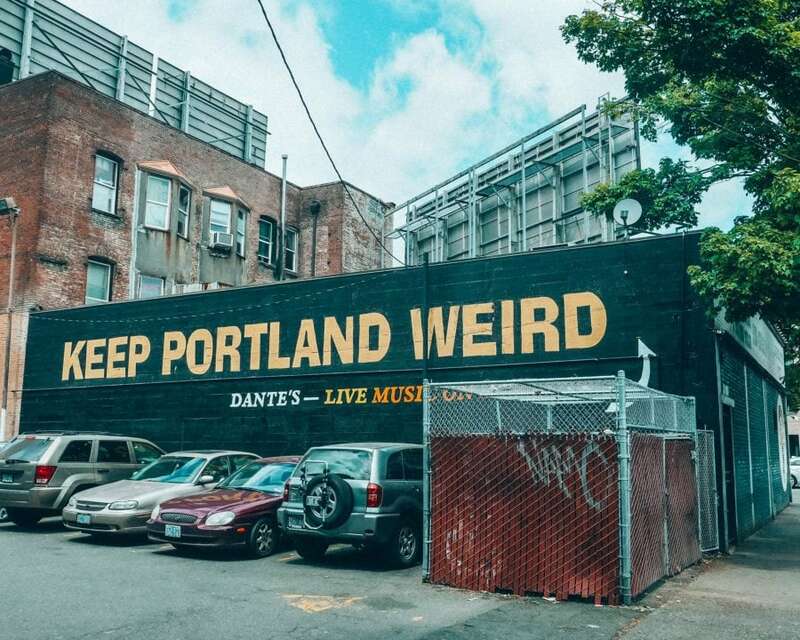 There are some spots held back for first-come-first-served campers too. There are two Bryce Canyon campgrounds, North Campground and Sunset Campground. North Campground is closest to the park entrance, visitor centre and Bryce Amphitheatre and Sunset Campground is a little further but still with views of Bryce Amphitheatre. Both cost $30 per site per night for RVs and $20 for tents. 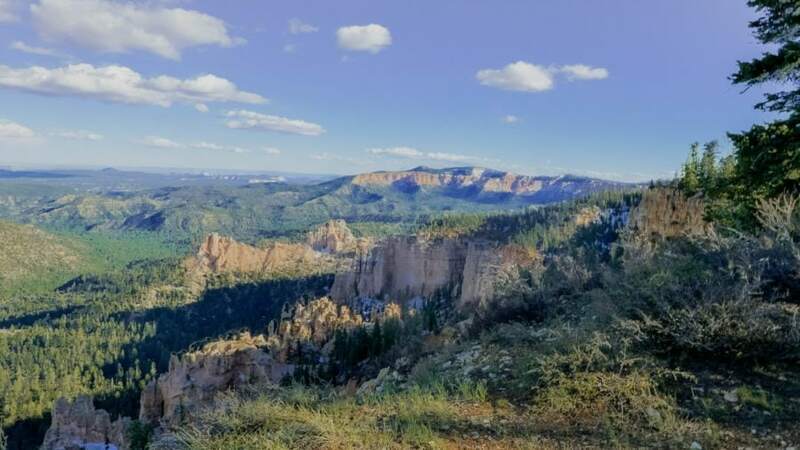 For a longer list of the best things to do in Bryce Canyon, take a look at this list of top things to do in Bryce Canyon National Park. Drive out to Rainbow Point, the furthest part of the park, and gaze at the incredible views! Take a hike! 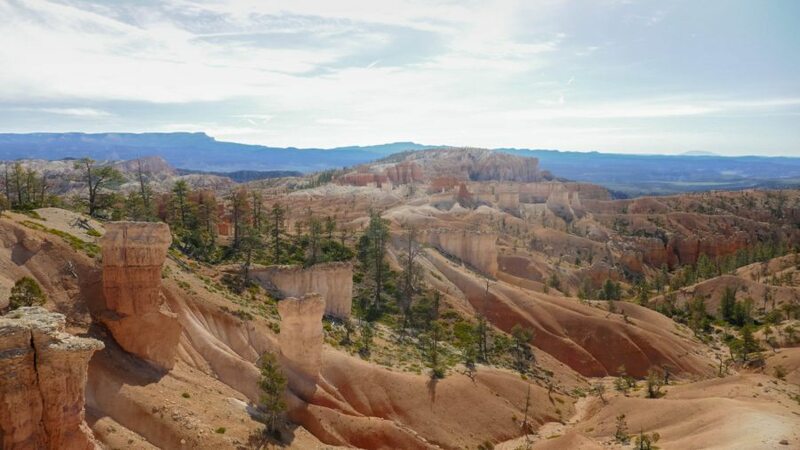 See below for the top 5 hikes in Bryce Canyon National Park. Bryce Canyon has some great hiking trails that range in difficulty and take you through some out-of-this-world scenery. 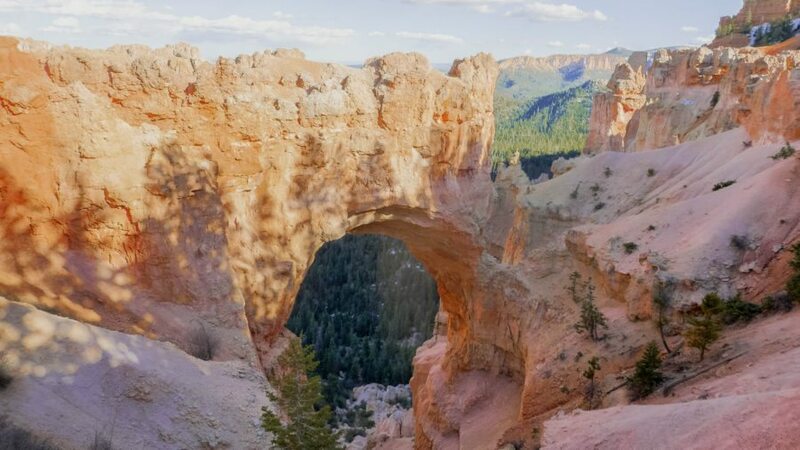 Here are 5 of the best hikes in Bryce Canyon. There’s so much to explore in the areas surrounding Bryce Canyon National Park. Here are a few other things to do. There aren’t a lot of choices when it comes to lodging inside Bryce Canyon National Park. If you are set on staying within the park boundaries then you can book a room at The Lodge at Bryce Canyon. This Bryce Canyon Lodge offers some cabins, motel rooms and guest suites & studios to book. For other places to stay near Bryce Canyon take a look at the top picks below. If you are travelling in RV, campervan or just want to tent camp near Bryce Canyon National Park then Ruby’s Inn RV Park & Campground is your best bet and it’s super close to the park entrance. There aren’t a lot of choices when it comes to campgrounds near Bryce Canyon. 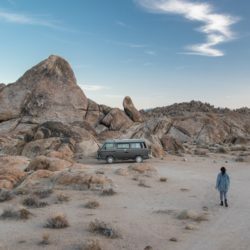 However, if you’re self-sufficient you may want to check out this post on camping for free in the US & Canada. We stayed in the National Forest just outside the park and it was perfect! Navigating around southwest Utah (and the US in general) is pretty easy. Here are some times and rough directions from other popular Utah attractions to and from Bryce Canyon National Park. A lot of people visit Zion and Bryce in the same trip. This is easily done since they’re so close to each other. To get from Bryce Canyon to Zion National Park you simply take the US89 southbound and then the UT 9 West. 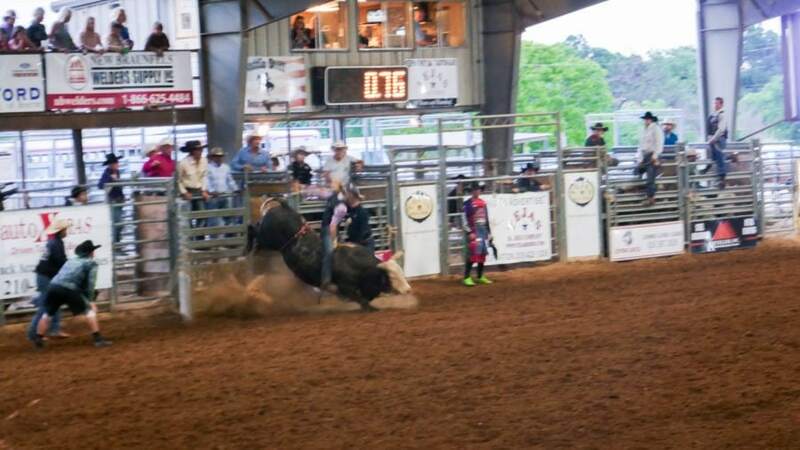 It takes about 2 hours to get between the two. Going to Arches and Canyonlands is a bit further. It’ll take you about 4.5 hours to get between the two. But, once you’re at Canyonlands you’re super close to Arches National Park and the cool town of Moab too. If you’re heading north to Canyonlands after visiting Bryce Canyon National Park Utah, then you’ll want to take the US 89 northbound and then the I 70 east. Bryce Canyon is open 24 hours a day with the visitor centre open between 8am-8pm in summer, 8am-6pm in October & April, and 8am-4pm in winter. Between April and October, there’s a park shuttle service which reduces congestion. It’s not mandatory unless you have a vehicle over 20ft or longer, but it’s recommended. The price of using it is included in the park entrance fees. The highest elevation in Bryce National Park is 2,743m. It varies from between 2,400m to 2,743m in elevation! This means that Bryce Canyon weather is often colder than you’d think. Leave no trace: Do not enter, alter, damage, or deface archaeological sites. Do not collect artefacts. Pets are allowed at Bryce Canyon with some restrictions such as always being leashed and on paved surfaces. Check this page before visiting Bryce Canyon with pets.